To be known as ‘Wonderlust’, EG Funds Management has submitted a development application to build a large mixed-use development comprising of two hotel and residential towers located at 24 – 26 Orchid Avenue, Surfers Paradise. The development is made possible by the consolidation of four lots totalling 5,254 sqm. 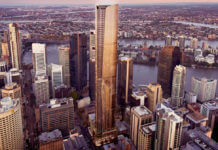 Situated across from the Towers of Chevron Renaissance complex, the new development would create a new cross block pedestrian link from Surfers Paradise Boulevard through to Orchid Avenue. Designed by Elenberg Fraser, the proposed towers will rise to 71 and 55 storeys high with each of the tower’s primary uses being permanent residential apartments, short term stay and hotel rooms. 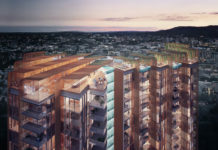 The development will feature a sizeable podium level pool club which will accomodate a nightclub entertainment facility, two main pools with smaller sunken pools, three bars, private cabanas, a dance floor and private jacuzzi rooms. 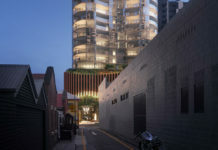 According to the development application, the proposed restaurants and bars become more intimate spaces above the pool club, with private dining areas looking out to the streets below. The key feature of the development is the Wanderlust Pool Club which will occupy the first podium level and will accommodate and attract world class entertainment acts to the City. ‘Wanderlust’, meaning “a strong desire to travel” was given to the development with the intention to encourage and instil desire for increased local, national and international visitation to Surfers Paradise. The buildings in which Wonderlust would replace currently accomodate a range of Surfers Paradise night club and bar venues. The development application number for this project is 201701214.